I guess many of you, like me, still have the odd bits left over from Christmas. The chocolates, admittedly, are long gone but I did have a large unopened jar of mincemeat that I had intended for mince pies but then never got round to making them. Everytime I opened the cupboard door the mincemeat berated me for neglecting it! I can across this recipe in a Good Food recipe book a couple of years ago but felt it needed tinkering with so tinker I did. The Good Food recipe called for diced marzipan but I felt it got lost during the baking so I went for a Stollen approach with a layer of marzipan running through the cake. I added a bit of spice and prettied it up with flaked almonds. 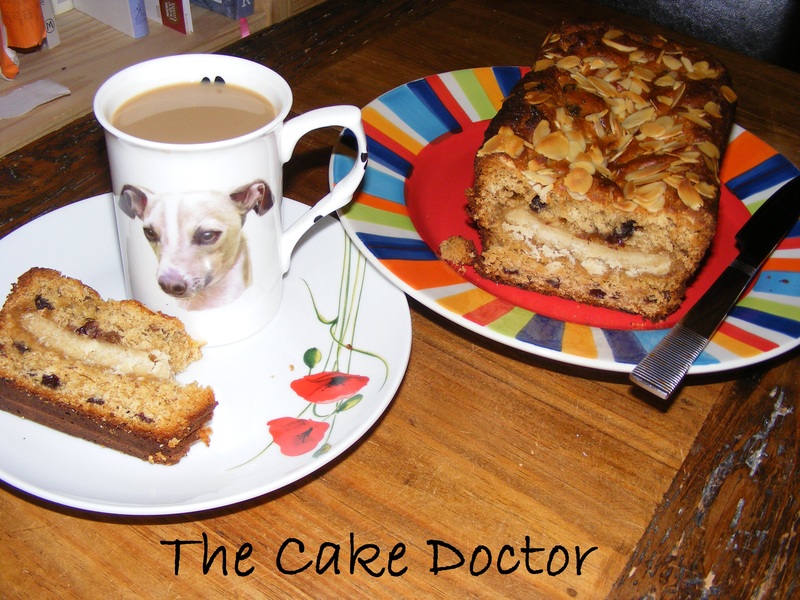 The resulting cake is moist and flavour packed and gorgeous with a cuppa after a long walk with the dogs. This recipe makes 2 x 1kg (2lb) teabreads which keep well in an airtight container but freeze well too. Rub together the flour, butter, spices and sugar until they resemble breadcrumbs. Add the eggs and mincemeat and mix well. spoon a layer of mixture into each loaf tin. Divide the remaining mixture between the tins.